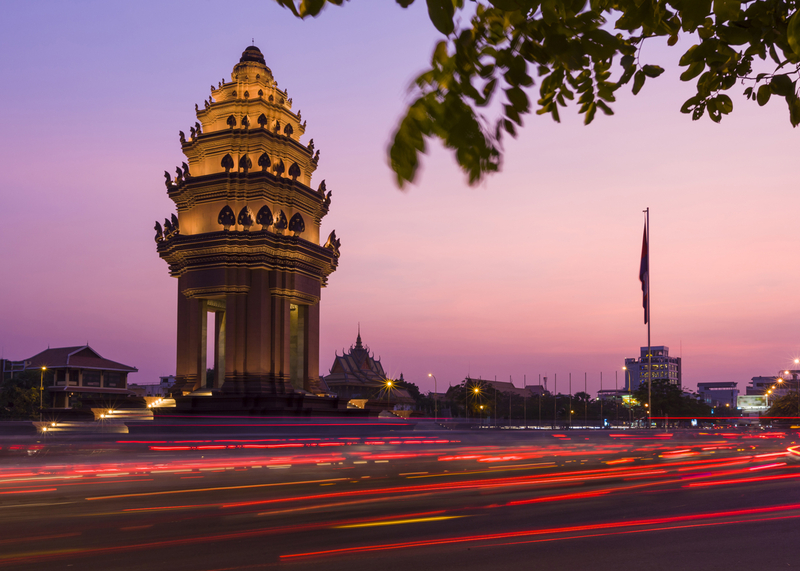 Cambodia, as we usually refer to it, often changed its names: the Khemer Republic, the Democratic Kampuchea, the People's Republic of Kampuchea. The last name sounds, by the way, very nice and somewhat magical. However, the long history of this marvellous andbeautiful country (it was born in the 18thcentury) is far from being magical. Itendured many colonial conquests, terror, genocides and even a serious civil war. Let's not talk about the sad past today, nowadays Cambodia can be consideredas prosperous state that seems to be its fair fate. After all, local nature is so amazing that you simply cannot help going into raptures over it! Abundanceof natural wonders and wildlife could be the main attraction of this enigmatic Asian kingdom. Without the slightest exaggeration, it hosts the unique concentration of flora and fauna. If you look through encyclopaedic data, the figures are impressive: 536 species of birds, 240 species of reptiles, 212 species of mammals and more than 800 species of freshwater fish. Rivers cutting through the country host freshwater dolphins. In the Cambodian jungle one can see 300 species of plants on one square meter. The truth is, Cambodia is now suffering from the destruction of forests on a colossal scale. Compared to the last century,forests have been destroyed by 40 percent. The Khmer alphabet is listed in the Guinness Book of Recordsas the longest in the world. The undisputed highlight of Cambodia is Angkor Wat. It is this temple complex that crowns the national flag of the Kingdom. Its flag is the world only national flag that depicts the building... Angkor Wat is the largest religious structure in the world. 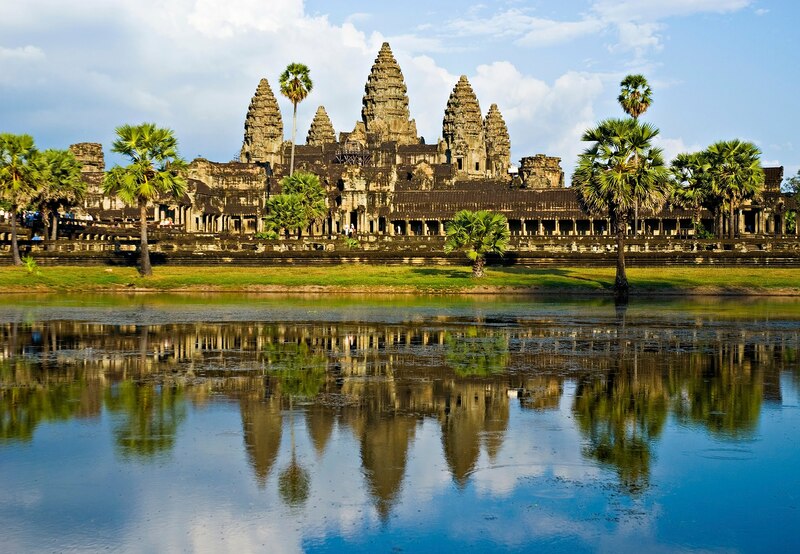 It is worth to come to Cambodia just to see this grandiose architectural creation. It is located in the heart of the country and covers an area of 1270 by 1500 meters. Notably, it is a Hindu temple that glorifies God Vishnu, however 95 percent of the population of Cambodia professes Buddhism. It was here that Angelina Jolie starred as Lara Croft, the tomb raider. After that, the actress adopted a local child. Cambodia is full of beautiful Buddhist temples and sculptures. Hidden deep in the jungle and crowning the main squares of cities - the ancient buildings are very interesting to study at least from an aesthetic point of view. Alas, the Khmer country holds not only funny records. The bloodthirsty war with Vietnam, the French colonization, the occupation of Japan and almost 50years of civil war after gaining full independence in 1953... In general, active bombing on all sides led to the fact that to this day Cambodia is considered the most mined country in the world: millions of mines were "scattered" here. This fact scares ordinary tourist, but do not be afraid: it is not dangerous in everyday life, just do not walk inside the jungle alongwild trails. In Cambodia you risk to feel old, even if in Europe you look like someone who is not allowed to buy alcohol. On the sunny streets of Cambodia you will see only the youngsters. Yes, people under 30 (!) years old are more than 70 percent of the total population. The birth rate in our time here significantly exceeds the death rate –by 3 times. Today the population of Cambodia is more than 15 million people. However, half a century ago it was only 3.5 million due to mentioned large-scale tragic conflicts. 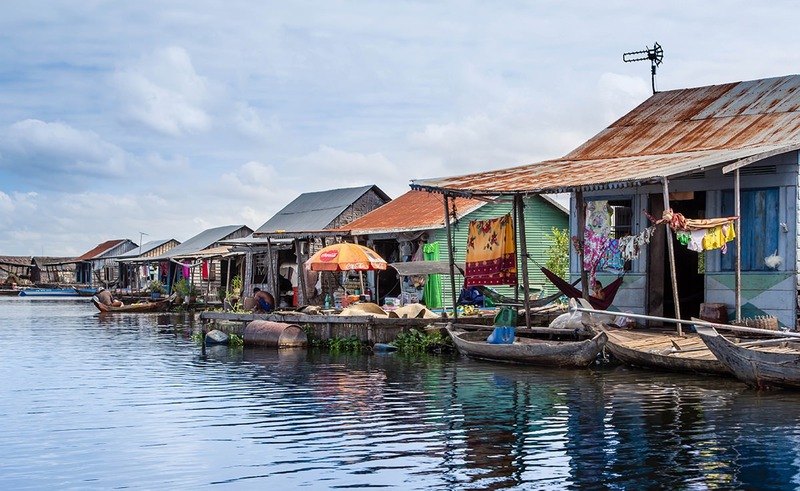 In Cambodia, a concept of drifting life can be understood in the literal sense of the word: a floating school, a hospital, a police station and, of course, a temple on the water. 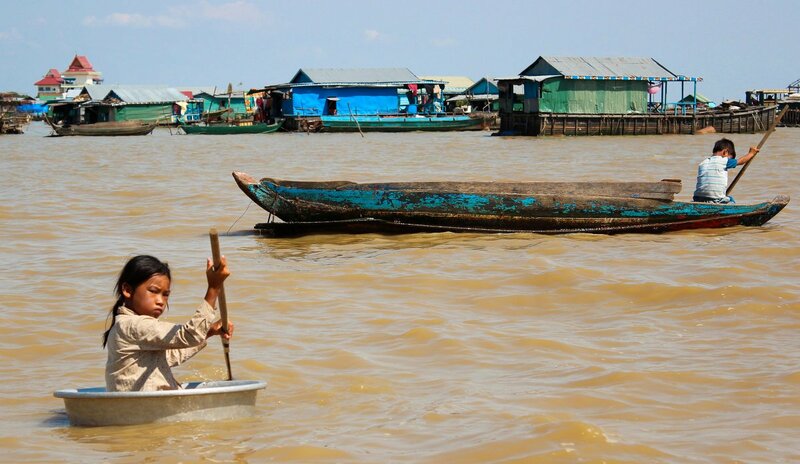 In Cambodia, there are dozens of floating villages on Tonle SapLake. This is a charming scene. Just imagine, hundreds of people live in such houses, children get to school on rafts, market trade occurs from boat to boat. The population of some of floating villages is greater than that of many villages. The village-record holder boasts five and a half thousand people. Not everyone, of course, lives in boats. 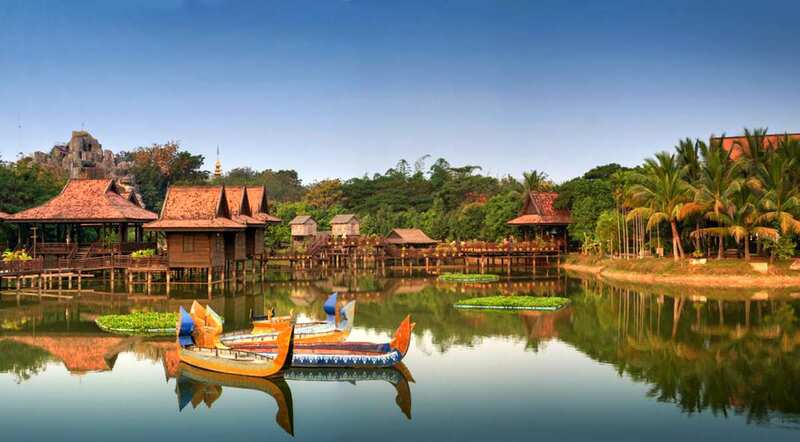 Some huts firmly stay above the water supported by long bamboo stilts, which are completely unseen in the "wet season" - a period of downpours. Surprisingly, they do not get flooded.Needless to say, there are hardly anyurban amenities. Many houses do not have even beds, not to speak of security guarantees. Nevertheless, many inhabitants of the Kingdomhave TVs, tape recorders and satellite dishes. Do not think that the Cambodians have lagged behind life. Though they use boats instead of cars, yet, they talk on mobile phones. To lying on veranda of such a house is just a wonderful pleasure. There is only one terrifying thing that is how the locals use lake: they do their laundry, wash dishes, throw all the impurities into water, and at the same time drink water from the lake. Yes, life expectancy in Cambodia is very low: the average age of death is 60 years. The education is at a high level: the usual thing is to meet a Khmer fluently speaking English and French. It should be noted that the Tonle SapLake is unique. The same name river flows into it but only for six months during the summer high water. When the rainy season ends, the river turns around and carries its waters into the Mekong River. Bonn Om Touk, the Water and Moon Festival,is dedicated to this event. It is celebrated in the full moon of November by conducting cheerful national rowing races. Have you eaten rice yet? This is greeting in Cambodian style. One should respond to it only withYes, thank you. And you? Rice is the main local food. Moreover, the rice industry is considered the most prestigious activity in the country, and any work related to it is paid more than any other. Speaking about the national cuisine,its other staples are shrimp, coconut, pineapple and chili pepper. It is not as spicy as in Thailand, but still be careful. 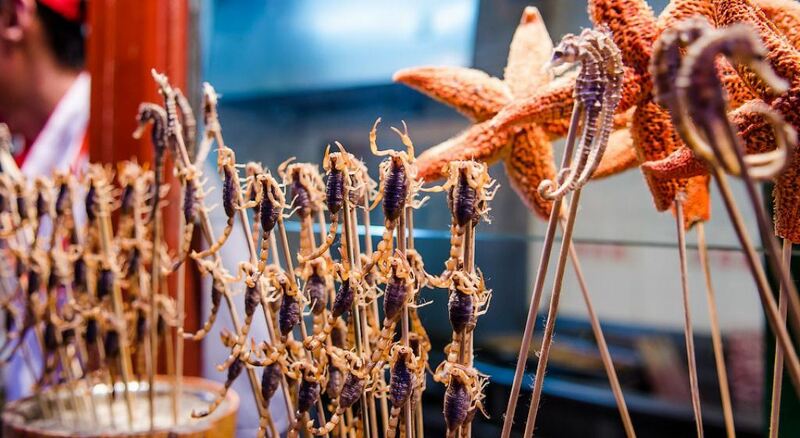 The exotic delights are shish kebab from snakes and scorpions sold at the night markets. In the mornings, it is recommended to taste delicious croissants and coffee - the legacy of the French colony. A special delicacy on holidays is fried spiders. The national fruit is durian. Cambodians are proud of local fruits, because it is generally accepted that they are much more delicious than Thai analogues. The national currency of Cambodia is Riel, and it is not divided into coins. Although in all cities, people prefer to receive dollars from you for goods and services. Dollars are preferred by taxi drivers, market vendors, museums and restaurants. Only in the remote Cambodian villages, residentsare not pleased by dollars. The exchange rate of the national currency here is surprisingly stable: over the past 15 years, for exactly 4 thousand Cambodian realties, you can buy 1 US dollar. As in most hot countries, it is necessary to bargain here. For example, tuk-tukers (local taxi drivers) "attack" tourists - the offer significantly exceeds the demand for services. Without fail, initially you will be offered a triple or even a five-fold price. Be sure to bargain to the price of 1 dollar per trip. It is advantageous to hire a tuk-tukas personal transport for a whole day - it will cost about 12-15 dollars.